by Peter R. Wechsler, RIA & Jeremy A. Wechsler, Esq. According to the latest actuarial estimates, many of us will be living into our late 90s and early 100s. That is a LONG retirement. It is now possible that some of us will be in retirement for more years than we spent working! Many retirees and near-retirees are facing the worrisome possibility that they will run out of money before their retirement is over. In “Solving The Retirement Puzzle With 4 Easy Pieces”, Peter Wechsler – Your Retirement Quarterback – and Jeremy A. Wechsler – Your Estate Planning & Asset Protection Attorney – lead you through the potential minefields of retirement and estate planning. As the co-founder and president of a boutique retirement financial planning firm in Willow Grove, Peter understands how critical income and tax planning, along with comfort level assessments, are when planning for retirement. As a dedicated estate planning attorney, and principal attorney of The Law Offices of Jeremy A. Wechsler, Esq., Jeremy provides solid insight as well as peace of mind when developing your estate plan to secure your wishes and legacy. In “Solving the Retirement Puzzle With 4 Easy Pieces”, Peter and Jeremy reveal their four-step discovery review process, with Peter covering Income Planning, Tax Planning, and Risk Exposure & Risk Comfort Level, while Jeremy covers the intricacies of managing Estate & Legacy Planning. You worked hard to build up your nest egg, saving and scrimping to ensure you could retire comfortably. Now that it’s time to retire, you must protect and preserve that nest egg while also leveraging your retirement funds for your future and the future of your children and family. In “Solving The Retirement Puzzle With Four Easy Pieces”, Peter and Jeremy offer the insights, tools, and techniques that are allowing hundreds of people across Bucks, Montgomery, and Philadelphia counties to retire with peace of mind and sleep well at night throughout their retirement. 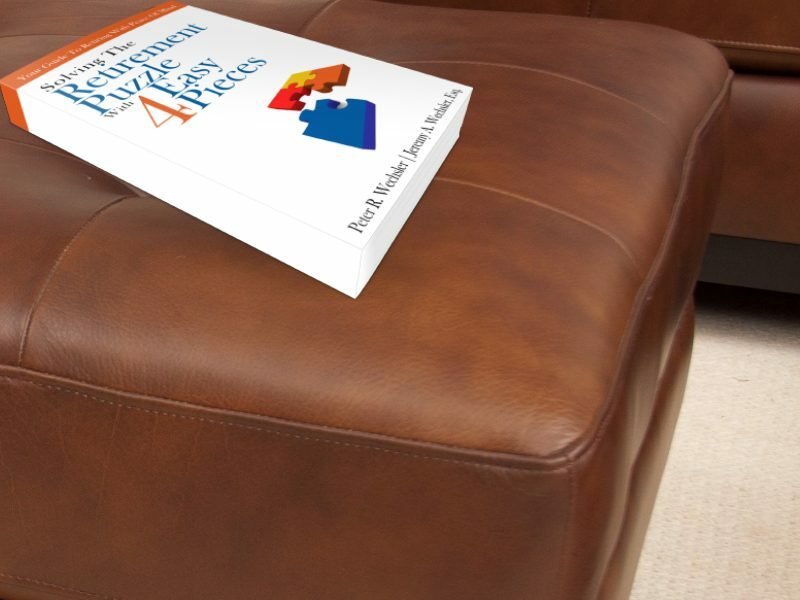 If you would like us to send you a copy of our book “Solving The Retirement Puzzle With 4 Easy Pieces”, simply fill out the form here and we’ll get you what you’re asking for.